Oh, my, another of Tarantino's film that I just can't help but admire. It's a truly brilliant film in a lot of ways. The characters are great, the dialogues are clever, it has lots of tension, and most importantly, you get so hooked in into the events that unfold in this small place. It started rather slowly, but it gets more and more exciting by the minute. Put it this way, after about half an hour I was checking my watch and thinking, "Okay, I'm 30 minutes into a 2 hour and 45 minutes film". But towards the end, I was like "Oh man, there's only 15 minutes left??". It was that exciting for me. This whole film, almost 3 hours long, is set in only two small settings - a stagecoach and a small cabin. That's all. Who on Earth could make a film that long in such small settings very exciting to watch? Tarantino, that's who. And who on Earth can make long conversations between several people just enjoyable to watch? Yep, you know the answer to that. For the most part, there isn't a lot of action. The film relies on dialogue and tension (and comedy, too) to make simple scenes between characters very interesting to watch. Of course, the distinctly unique & interesting characters help (again, partially due to Tarantino's genius). Despite having eight characters to follow, each are unique in their own way, and its easy to remember these characters. And they are so brilliantly acted by the cast. All of them. Sam Jackson, Walton Goggins, and especially Jennifer Jason Leigh, who I really admire in this film. It's like these actors really raised their performance another level for this film. And then there's the score/soundtrack...simply mistifying!! Even from the opening theme, I was already loving it. It was full of tension and...just simply brilliant. You should hear it yourself to understand it. I can't help myself from hearing it over and over again, now. (As, usual you can find it in YouTube, if you're curious about the music, and listen to "L'ultima diligenza di Red Rock"). Ennio Morricone is a genius, and he totally deserved that Golden Globe (and hopefully, the Oscar, too). 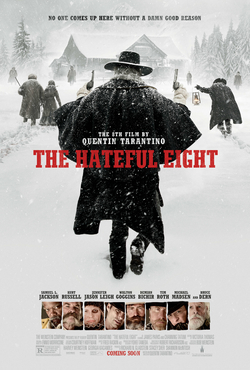 In a lot of ways, this is a unique film (or in other words, a Tarantino film) which has very exciting plots & characters, brilliant scenes & powerful dialogues. It does start a bit slowly, but as it goes on, it only gets more exciting, and by the end, the 2 hours 45 minutes feels too short. A truly brilliant film!